The Laparoscopic Sleeve Gastrectomy - often called the sleeve - is performed by removing approximately 80 percent of the stomach by a stapling device. The remaining stomach is a tubular pouch that resembles a banana. This procedure works by several mechanisms. First, the new stomach pouch holds a considerably smaller volume than the normal stomach and helps to significantly reduce the amount of food that can be consumed. The greater impact, seems to be the effect the surgery has on gut hormones that impact a number of factors including hunger, satiety, and blood sugar control. Short term studies show that the sleeve is as effective as the roux-en-Y gastric bypass in terms of weight loss and improvement or remission of diabetes. There is also evidence that suggest the sleeve, similar to the gastric bypass, is effective in improving type 2 diabetes independent of the weight loss. 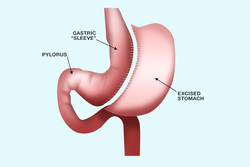 The complication rates of the sleeve is much lower than with the gastric bypass. Dr. Kakkilaya has extensive experience and special interest in Sleeve Gastrectomy.